The songbirds at your feeder depend on Canada's boreal forest--and so do you. The Mountain River flows through wild country that harbors vast amounts of carbon. Oil and gas development and global warming could turn it loose. This article was written by Nancy Lord and published by the Sierra Club in March/April 2008. AS FAR AS OUR GUIDES from Nahanni River Adventures knew, no one had ever flown an 18-foot raft (deflated) to Dusty Lake, near the headwaters of the Mountain River in Canada’s remote Northwest Territories; portaged it and three canoes, coolers full of frozen steaks and oranges, cases of wine, tents, and Dutch ovens for the better part of a mile over ankle-twisting tussocks; and then plunged and scraped down the upper portion of the river to where it converges with the usual canoe route at Black Feather Creek. So we’re claiming a first descent. The July air at our 4,000-foot-high put-in was pleasantly cool and nearly bug free. The dwarf birches were freshly leafed, and the ptarmigan we flushed still sported some white winter plumage. Clouds hung on the angular peaks that towered around us, but the land–so close to the Arctic Circle–was bathed in constant light. It was all downstream from there–12 days, 3,830 vertical feet, and 190 miles to the mighty Mackenzie River. 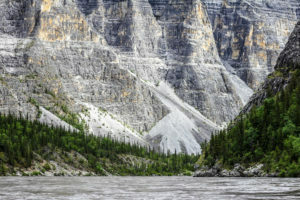 My fortunate life has given me more than my share of spectacular mountain scenery, but here every bend in the river opened up a new vista, each distinct from the last, of the descriptively named components of the Mackenzie Mountains: the Backbone Range, Stony Plateau, the Shattered Range. Some were high and craggy; others were rounded by long-gone glaciers, talus-heaped, tilted and twisted, and eroded by wind and water. Dall sheep stuck to their sides like tiny patches of snow, and eagles soared over them. 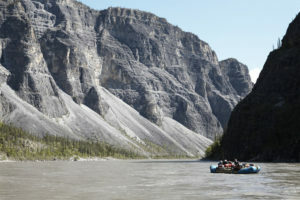 The Mountain is known as one of the best canoeing rivers in Canada, with its continuous run of fast water, wave trains, boils, whirlpools, and chutes passing through seven narrow canyons filled with sharp bends, junctions with smaller tributaries, and tricky channel choices. As a member of the raft team–my canoe skills fall short of negotiating Class III rapids–I got my workout back-paddling through tight corners and trying to avoid smashing into rock walls while our guide did the heavy rowing. For the most part, however, the raft bobbed like a big rubber duck atop the fast-moving water. Spotted sandpipers raced us along the shoreline; overhead, a kestrel shrieked as it tussled with a raven. Each passing day dropped us through new, increasingly rich landscapes. First came pencilish black spruces clinging to thin mats of soil over rock and stones, soon joined by balsam poplars, sweet smelling as we boated past, and willows that turned their leaves to shimmer in the breeze. Lower still came tamaracks and the white trunks of birches, understories crowded with juniper, Labrador tea, wild roses already going to hips, pink paintbrush, and glowing candles of goldenrod. We discovered wild strawberries trailing into sandy areas and climbed to alpine meadows to pick ripe blueberries. This is a small part of Canada’s 1.2 million square miles of boreal forest (named for Boreas, the Greek god of the north wind). The Northwest Territories, an area twice the size of Texas with only 40,000 people, is almost entirely boreal. In addition to trees and wild rivers, the ecosystem is marked by wetlands, peat bogs, and tundra that shelter 3 billion nesting and migratory birds–including many of those that frequent U.S. bird feeders. It’s also one of the largest carbon storehouses in the world. Acre per acre, boreal forests lock up more carbon than any other forest ecosystem on Earth. Canada’s boreal region alone stores the equivalent of 27 years’ worth of global carbon dioxide emissions from burning fossil fuel. To keep this carbon out of the atmosphere, last May 1,500 international scientists recommended to the Canadian government that at least half the boreal forest be preserved in its natural state and that only ecologically sound and sustainable development be allowed in the rest. That goal is shared by Native Déné and other people living in the Northwest Territories. 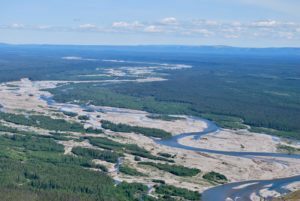 Last November they were rewarded when Canada announced the provisional protection of nearly 40,000 square miles of boreal forest–an area 11 times the size of Yellowstone National Park–including 5,800 square miles on the west side of the Mackenzie River. Stephen Hazell, executive director of the Sierra Club of Canada, calls it a “huge accomplishment for nature conservation” but warns that protection is far from permanent and could be reversed by a future government. The pressures for development are enormous, given the high commodity prices for gold, zinc, and uranium. As we floated down the river, a plane flew overhead under gathering clouds, and we wondered if it was headed for a mining camp that had just been established not far from where we’d put in. EACH DAY THE RIVER WIDENED, delivering us past whirlpools, down narrow canyons, and along gravel bars bright with river beauty blossoms. We added our footprints to those of grizzly bears, moose, caribou, wolves, and Dall sheep. A lone woodland caribou–more solitary than the barren-ground variety that migrates in huge herds–clicked across a meadow. We floated down toward a small grizzly swimming the river. Seeing us, it returned to shore, shook itself off, and ran into the brush. Canada geese with their young paddled out of our way, and once a flock of sandhill cranes bugled past, all long necks and trailing legs. Smaller animals too–beavers and chipmunks, thrushes and sparrows–swam and chittered and sang around us as we paddled, camped, and added to our collections of colored stones. The Mountain ran muddy and then clearer and green as side streams emptied into it. Always the sound of the river was with us, rushing and bouncing us along or caressing our dreams as we slept. I listened and was lulled into its rhythms and awed by its power. One afternoon a small caribou with spiky antlers and alert ears waded nervously into the river ahead of us, as though afraid to attempt the crossing. It stood chest-deep as we slid past before turning back to shore–just as a dark wolf emerged from the brush, only yards away. We strained to watch, but the river pushed us along, pulling the curtain on the gravel-bar drama. IN CANADIAN GOVERNMENT OFFICES and corporate suites, a larger drama is unfolding–one capable of bringing massive change not only to the Northwest Territories but also to the world’s climate. The proposed Mackenzie Gas Project, a $16 billion pipeline backed by a consortium of four oil companies, would carry natural gas from Canada’s Arctic coast 760 miles down the east side of the Mackenzie Valley to Alberta, transforming the now nearly roadless landscape, fragmenting habitat, and destroying forests and wetlands. Conservationists and residents fear that its feeder lines and roads would open the entire basin to additional development, preempting conservation efforts and limiting local influence over land planning. While environmentalists do prefer natural gas to oil and especially to coal, the Mackenzie pipeline gas will likely never heat anyone’s home. Its more probable destination is Alberta’s vast tar sand fields, where it would provide the tremendous heat necessary to separate sludgy oil from intermixed sand, clay, and water. By 2015, the increased demand for natural gas by Canada’s tar sand industry alone will equal the capacity of the Mackenzie pipeline. FAR FROM OUR STEEP, ADRENALIN-FILLED ENTRY into the Mountain River, our last miles to the confluence with the Mackenzie River and a pickup by freight canoe were a slow paddle and row across flat water. The mountains receded into the distance, even the foothills faded behind us, and the sky, dotted with cotton-ball clouds, suddenly seemed immensely wide. We spotted the channel markers that guide boats around a set of Mackenzie River rapids, and the waters of our wild Mountain River merged into Canada’s longest. The far shore formed a band of light and darker green–the willows, poplars, and spruces of more boreal forest. Perhaps ten miles beyond lay the route of the proposed gas pipeline. David Livingstone, an environmental official with Canada’s Department of Indian and Northern Affairs, regrets that the establishment of protected areas has been so slow but believes the consensus process is essential to secure development within a conservation framework. Pressure to get the job done, Livingstone says, will mount as the pipeline–“a basin-opening project,” he calls it–gets closer to reality, though he also acknowledges that “the pipeline is not going to be held hostage” by those who would put obstacles in its way. THE FREIGHT CANOE DROPPED US at Fort Good Hope, where we sought out our lodging. The owner of the house we stayed at lived next door. When we arrived, he was smoking moose meat in the backyard and doling out hunks to village women who came by with plastic shopping bags. Fort Good Hope, population 585, has two stores, government offices, and a Roman Catholic church dating from the 1860s, but in fundamental ways it retains its Déné traditions and values. Native people clinging to traditional lives are not the only ones with a stake in what happens here. In our overheating world, what happens in the carbon-rich Northwest Territories affects Ohio farmers, Bangladeshi fishermen, and African children alike. People who will never hunt moose or run a rapid can still be grateful for the wild Mountain River.